ये थी असली वजह अमेठी से भागने की तो आप देश को इस्लामिक बनाने की राह पे हैं क्योंकि हाथो तिरंगा नही कुछ और ही हैं फिर ये नकली हिन्दू का ढोंग क्यों राहुल ? जिनके दादा ही हिन्दू होने पे शर्म करते थे वो भला दिल से हिंदुत्व को स्वीकार कभी नही कर सकता हैं (This is the reason for fleeing Amethi; you are on the way to making this nation Islamic, because in your hands is not the tiranga but somethint else, then why this drama of being a fake Hindu, Rahul? He whose grandfather was ashamed of being Hindu, can never accept Hindutva in his heart- translation). The above message has been shared in the aftermath of speculation that Congress President Rahul Gandhi may contest from Wayanad, Kerala in the upcoming Lok Sabha election. It has been shared along with a video which shows green-coloured flags bearing a crescent, waved in a street rally. The video is 24 seconds long. The logo of News18 can be seen on the top right corner of the video clip. The above post is by Nation Wants Namo, a Facebook page with over 230,000 followers, and has been shared over 4300 times so far. The video has been watermarked with the words, “Wayanad welcomes Congress’ decision with Islamic flags (translated from Hindi). Rahul to fight elections in Wayanad , Kerala. Look who is celebrating in Wayanad waving Pakistan flags. Now you know why Congress selected this constituency. The video has also been shared with the message in Telugu. The video is viral on Facebook with the Hindi text. The message has been shared widely on WhatsApp too. The green-coloured flags seen in the video represent the banner of the Indian Union Muslim League (IUML). IUML is a political party based in Kerala. Its banner is visibly different from the national flag of Pakistan. The two have been juxtaposed and posted below for comparison. The gathering and celebration by IUML cadres was in response to unconfirmed reports of Rahul Gandhi contesting from Wayanad. It may be noted that the IUML is in an alliance with the UDF for the upcoming general election. This gathering was reported by News18 Kerala on March 26. In the video posted below, from 5:45 onwards, the relevant portion can be viewed, in which green-coloured IUML banners can be seen. Alt News has observed on numerous occasions how green-coloured banners at political rallies are claimed to be Pakistani flags. This misinformation is then shared widely on various platforms. 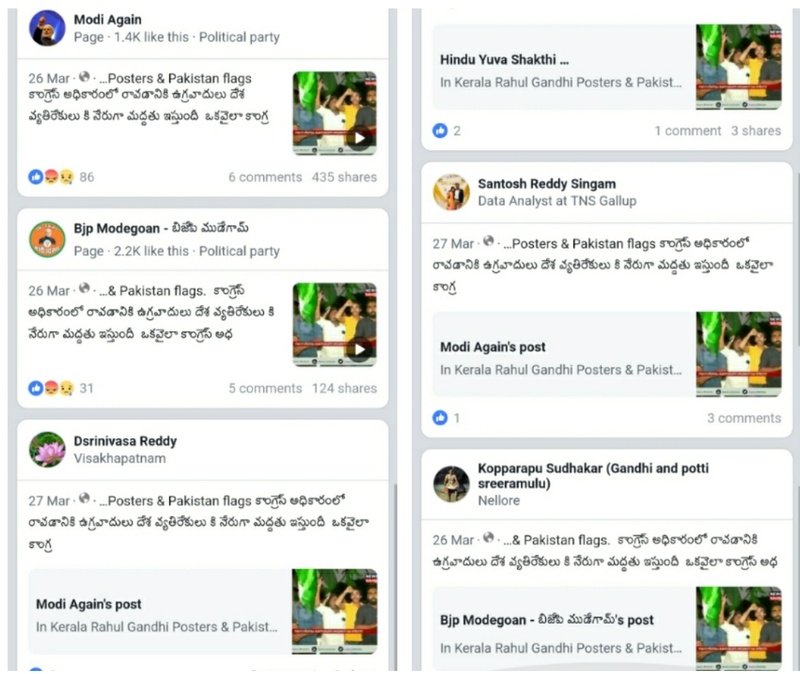 Earlier in May 2018, ahead of the Karnataka assembly election, an IUML flag at a Congress rally was falsely alleged to be the Pakistani flag. The same video had resurfaced a few days back on social media, with the same claim.